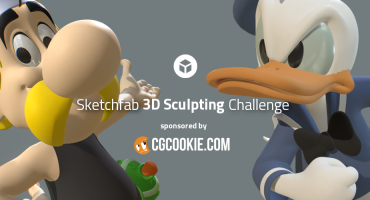 Sketchfab Community Blog - Sketchfab Sculpting Challenge: Cartoon Characters! This month we’re aiming for a very different visual sculpting style as we’re exploring cartoon characters. This means stepping away from the highly detailed, matcapped sculpts and into clean, brightly colored models. So return to your childhood and bring back your favourite characters. See you soon for the next round, and don’t forget to check out the Sketchfab & Mozilla Medieval Fantasy Contest! Join to win a SculptBox by CG Cookie and improve your clay sculpting skills! TL:DR; sculpt an existing cartoon character and publish it on Sketchfab with the #CartoonChallenge2017 tag. Sculpt an existing (2D) cartoon character using your favourite sculpting tools. Once you’ve created your scene, upload it to Sketchfab, tag it #CartoonChallenge2017. The winner will receive a SculptBox by CG Cookie (value of $97). With hand-picked tools, trusted materials and expert know-how, SculptBox has everything you need to start sculpting – in a single package delivered straight to your door. The SculptBox will ship internationally, and Sketchfab will reimburse any import duties. Of course we’ll also add three months of Sketchfab PRO to your account! Contestants models must be uploaded to Sketchfab and tagged #CartoonChallenge2017 to be considered. The winners will be contacted by Friday, October 6. Hi, great challenge. May I ask, does the character have to already exist, or can we make up our own ? P.S. Can it be an Anime or Manga style character ? I’m really gonna try and make time for this one! Sounds interesting… just need to decide which cartoon character to model. 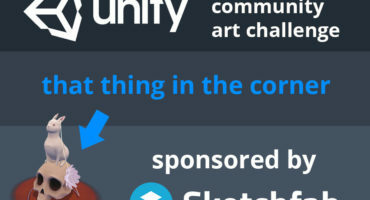 Correct – this is a fan art challenge. The two embeds in this post were made with Zbrush, but you can use any sculpting software like 3D-Coat, Sculptris or Blender for this challenge. Good luck! Yess ! I kney it ! I knew that subject was coming someday ! Excellent 🙂 Which character will it be? Anime is fine, and doing a revamp is ok too. I’d just make sure the character is still easy to recognise though. Good luck! Hi Amro, if you need any help with work you’re always welcome to start a topic on our forum too! Great topic. However, it means it’s mandatory for the model to be sculpted? Modeling with quads won’t be correct for the contest? All right, thanx for the info! The entries will only be judged for their sculpting qualities. While you’re welcome to add animation, you won’t receive any extra points for it. Good luck! You should be able to find plenty of reference material on the internet I think? Are considered cartoon for the contest also pixar, dreamworks movies and movies with 3D stylized characters? No, please base it on your favourite 2D cartoon character. I’ll clarify that in the rules. O the 3 months of pro is a prize ? Correct – the winner gets the SculptBox and 3 months of PRO. Can it be sculpted in a VR environment like Masterpiece VR?